Thanks to Radio-identification, the actions of several animals may be distinguished within a group. It opens new perspectives regarding social behavior studies and the influence of social interactions on individual behaviors. 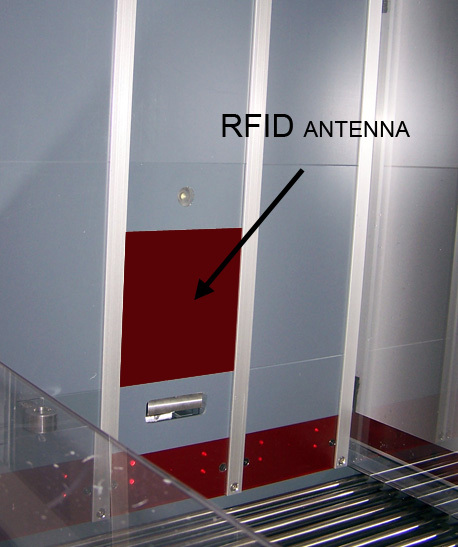 Radio-Frequency IDentification (RFID) allows communication on short distance between an emitter and a receiver. 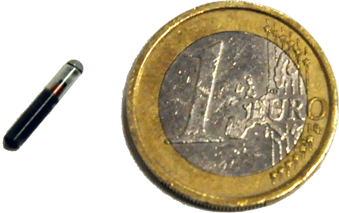 The emitter is a small capsule (size of a grain of rice) that is often implanted under the skin of the animals. We integrate the receiver in our apparatus. It collects the data recorded on the tag when detected, and communicates the informations to our software in real time. 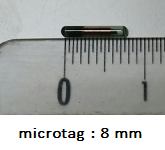 The electronic tag is programmed by the experimenter to affect an individual code to each animal. Positioning a receiver next to an acuator in an apparatus (a nose-poke for example) will inform us on the identity of the animal which interacts with the actuator (which visits the nose-poke for example). Our software totally manages the RFID component, so that the experimenter knows in real time what animal does what in the apparatus. Several rats may be put in one home-cage. On the front of the cage, an opening gives access to a compartement equipped with three troughs. When entering the compartment, the animal is identified thanks to its tag. Moreover, the experimenter knows which trough has been visited thanks to infrared beam located at the entry of each trough. Thus, this system allows fine analyses of feeding behavior in a social context. 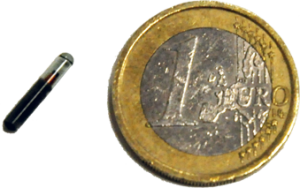 Self-feeder for Fish: an antenna is imerged in a basin, in front of a sensor. The activation of the sensor lead to the distribution of food. Every fish is equipped with an electronic tag, with individual data. When the sensor is activated, the experimenter knows which fish has activated the sensor, thanks to the data of its tag. This equipment is used mainly to analyze individual feeding behavior of fish within a group.